Unless I get bopped on the head and start remembering things I've forgotten (and don't remember forgetting) this is my first published business book review, not counting stuff I (think) I did for the local Mac club. Chauncey Mabe, then and now the Sun-Sentinel's books editor, had me pegged (don't laugh) as a high-end novel guy — popular literary stuff like John Irving — and resisted my entreaties to review biz books until he finally acquiesced with this one. Upon publication, in January 1999, he told me, "No more," but by June of that year, I was at The Miami Herald as a copywriter/producer/project manager in the creative services department, and the only stuff that ran in the Sentinel (or New Times) were things already in the pipeline. The following year, I began my weekly column in the Herald's Business Monday section. Published Sunday, January 31, 1999 in the Sun-Sentinel (Broward/Palm Beach Counties, Fla). 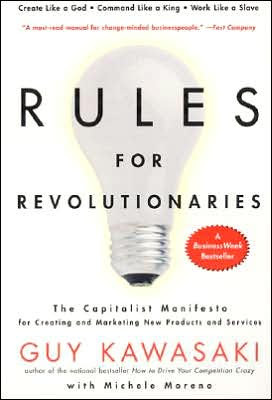 RULES FOR REVOLUTIONARIES: The Capitalist Manifesto for Creating and Marketing New Products and Services. Guy Kawasaki with Michelle Moreno. HarperBusiness. 224 pages. In the early 1980s, Guy Kawasaki was Apple Computer's original "evangelist" whose mission was to persuade the era's skeptical (and often recalcitrant) software developers to create computer programs for the company's nascent and prescient Macintosh. Now the head of a Silicon Valley-based venture capital matchmaking firm, Garage.com, Kawasaki understands the value of learning from one's mistakes. In and out of Apple's corporate orchards during the intervening years, he's lent his considerable expertise to a number of books on marketing and product evangelism. This Guy knows his stuff — and his audience. To some, marketing is voodoo; it's not sales, per se, which tends to be black and white, and quantifiable. Marketing appears far too amorphous and complex, so books on the subject generally seize upon a principle or two and apply 'em to as many cases as possible. Because new product introduction is nothing if not marketing, Rules For Revolutionaries takes its decrees and then provides ample observations and analyses to back up each point. With generous dollops of humor, irreverence and wisdom borne of his and others' corporate ups and downs, Rules For Revolutionaries' text is deceptively facile, but so densely packed, it's nearly impossible to absorb this huge and diverse mass of sagacity in a single reading. This is no small accomplishment. Many marketing tomes pretend to be weighty philosophical dissertations, but are too glib and paper-thin. Rules For Revolutionaries is the antithesis of this; it's bigger inside than its appearance suggests. Naturally, given his Apple battle scars, there are numerous references to Macintosh campaigns. The triumphs and tribulations accompanying the creation, introduction and development of the prototypical user-friendly computer (replete with embarrassments, dumb luck and the occasional planned success) add authenticity and brio to Rules For Revolutionaries. But the book is hardly a pro-Apple screed. Kawasaki's unequivocal partisanship is readily tempered by stinging self-deprecation. Despite his and Apple's valiant efforts at withstanding Bill Gates' assault, the author, in a Q&A on product evangelism, nearly chokes in response to his own question on the hardest thing he had to do: "admit that despite all the evangelism I did, Microsoft Windows was going to control the world." As a guidebook for new product introduction, Rules For Revolutionaries more than fulfills its mandate. But it is well worth recommending to those involved in marketing, sales, advertising, management and other business endeavors. Its sly, delightful insights and practical suggestions will almost effortlessly empower anyone seeking to bring a product, idea or dream to fruition.